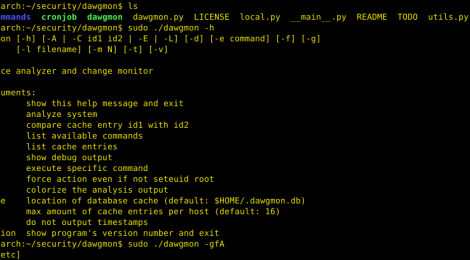 Browse: Home / dawgmon – attack surface analyzer and change monitoring tools. dawgmon is an dawg the hallway monitor, monitor operating system changes and analyze introduced attack surface when installing software. The tool is not meant for complete accuracy. There are very serious recommendations normally to not rely on the output of GNU core-utils such as ls for tool input. In other words; one should rarely build tools to parse and rely on this type of output as it can change all the time. Realistically the output of these tools is relatively stable as a lot of people and automatic tools already rely on their outputs for all kinds of purposes. and run analysises including those new commands. ← RHAPIS – Network Intrusion Detection Systems Simulator.